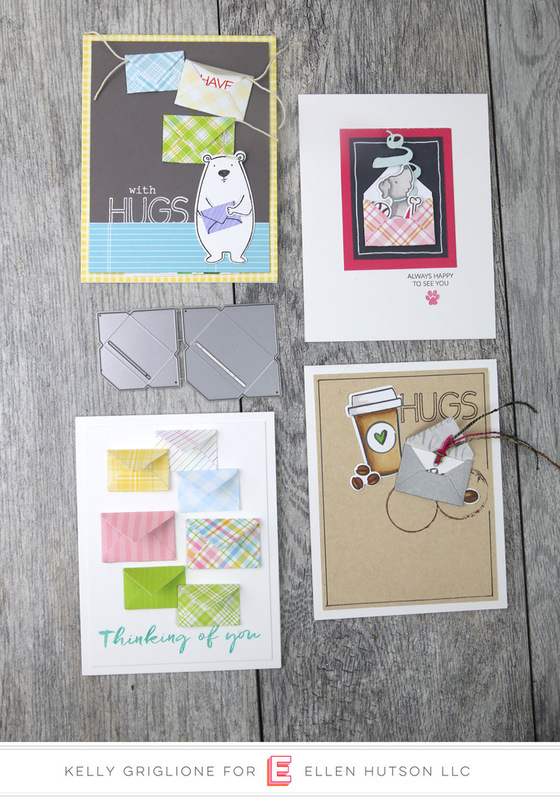 Even as a seasoned card maker, I enjoy learning tips & tricks from other crafters. My favorite tip/trick is something I actually learned recently. When I get a new set of dies, I keep the major dies connected together, and remove any smaller dies attached inside the major dies. 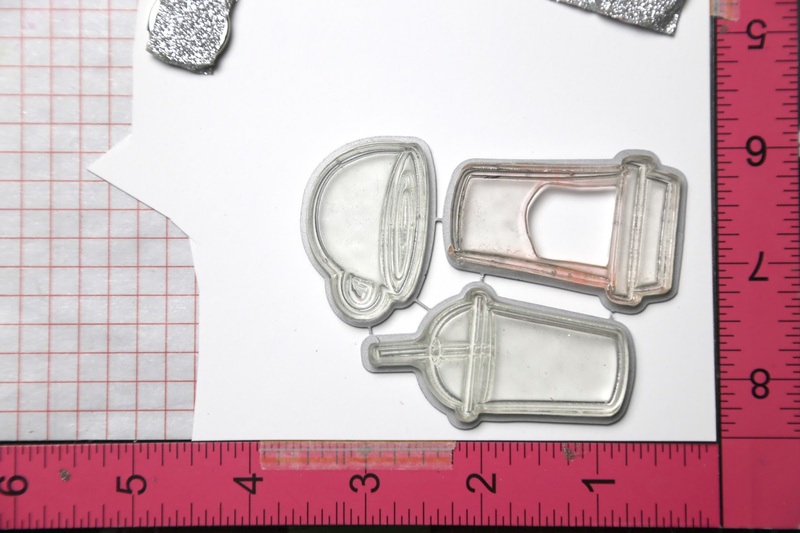 When I need to cut an image, I put the connected set of dies face down on my MISTI and then carefully lay the corresponding stamps face down on top of the dies. Once they're all perfectly centered, I close the MISTI, open it back up, and start stamping. Now it's super easy to line up the dies over the stamped images and cut them all out at once. Since the stamps are already set up I'll usually make a couple additional sets of die cuts before putting the stamps away. 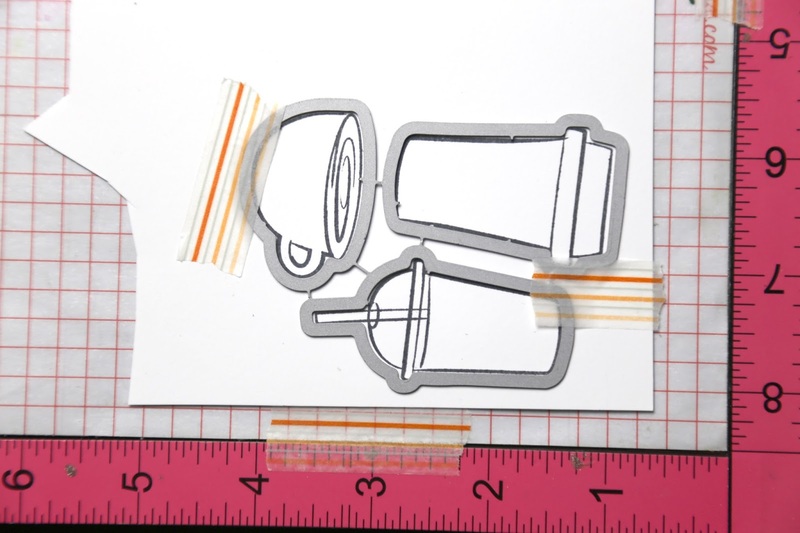 If I don't use all the die cut pieces I'll store them in back of the stamp set. 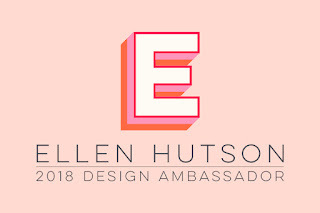 Folks, I am SO PLEASED to be a part of this hop, as it means that I'm officially on the ELLEN HUTSON DESIGN TEAM!!! Can I get a "heck yeah"?! I'm so thrilled to work with this amazing company led by Ellen, one of the kindest and sincerest people around. Then, as you know, the design team members are all crazy-talented. What an unbeatable combination! We put this hop together as a way to get to know everyone a little more. You may have come from the awesome Justine Hovey but if not feel free to start at the beginning in the CLASSroom. We're sharing a project that represents our style and/or what we enjoy doing. One of my favorite things is to come up with different ways to use the same product. 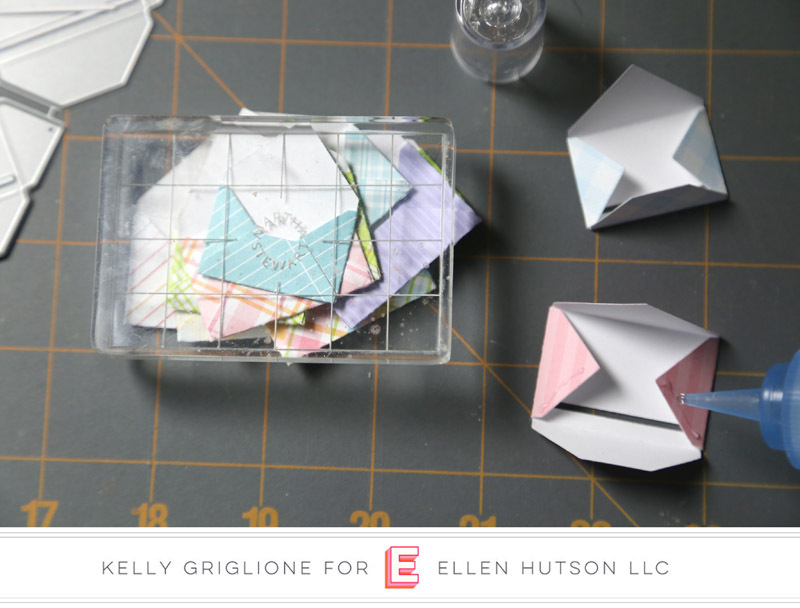 Today I had a ton of fun playing with different ways to use the Essentials by Ellen Envelope Slider Dies. These pretty papers are all from some of Lawn Fawn's recent Spring releases. Once they were all cut I ran a very fine line of glue along the flap edge to adhere them together. 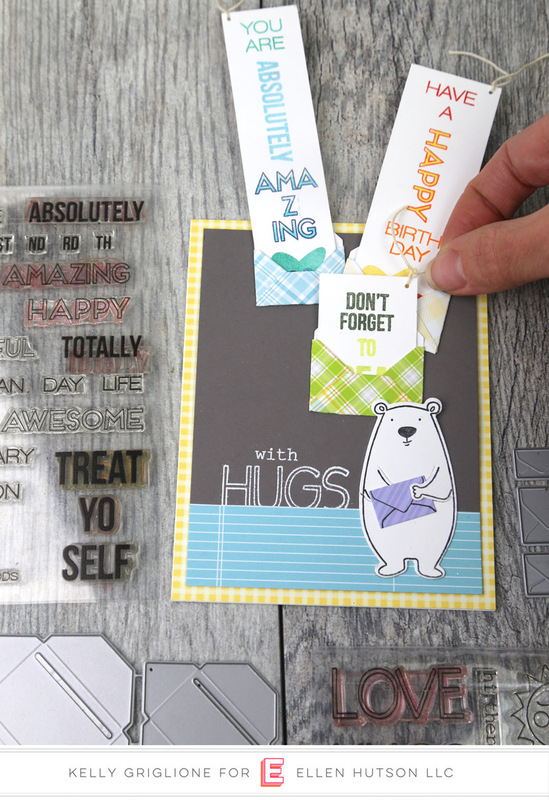 Tip: put an empty acrylic block on top of the envelopes until the glue is dry for a permanent bond. 1. Hide your sentiment - This is handy when you just want the focus to be on your images and/or you don't want to add any more business to your design. Here I still wanted to say a little more than just "hugs" so I added a longer sentiment from the Oh Frappe! stamp set and inserted it into the magic envelope. 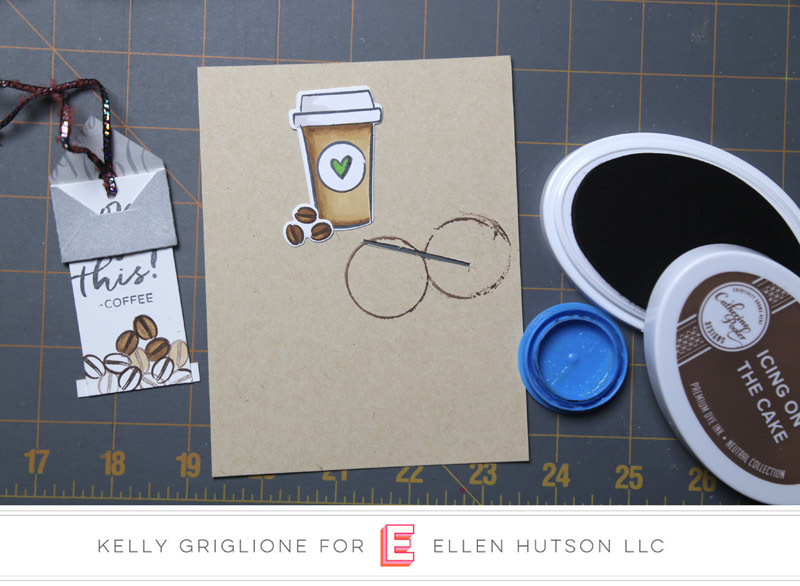 Quick tip: the two coffee rings were made by inking up the ridge of my milk carton top and spritzing it with water before stamping it onto the paper. I think it's pretty realistic looking! And fills the space. Here you can also see the slot where the sentiment will disappear into the envelope. 2. 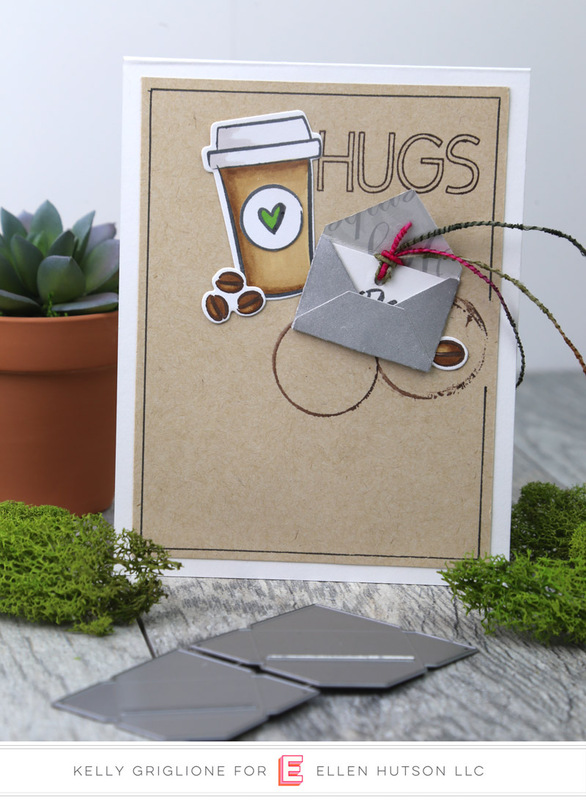 Make several different envelope/sentiment combinations for a very interactive card. Seeing the strings coming out of the envelopes is a clue to the recipient that something's inside. Are you curious to see what it is? Birthday wishes! It was fun using most of the words from Essentials by Ellen Totally Awesome to make three different sentiments that can be pulled up and read in any order. 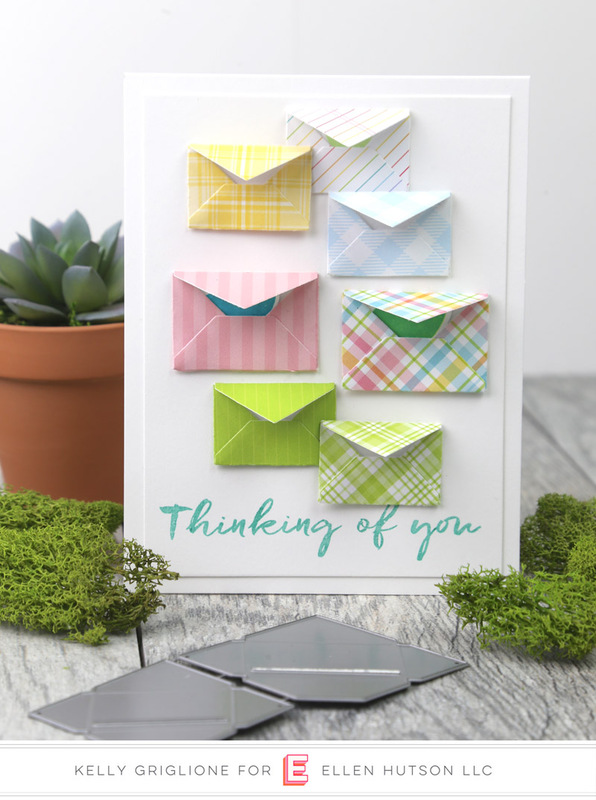 Here's another tip: to make sure you have enough room for the sentiments to disappear through the envelope and behind the panel, place it on top of your card with the top of the sentiment inside the envelope. Then just make sure the bottom of your sentiment does not extend past your panel. Also, this picture shows the little stopper bar I added to the bottoms so the sentiments cannot get pulled completely out of the envelope. 3. 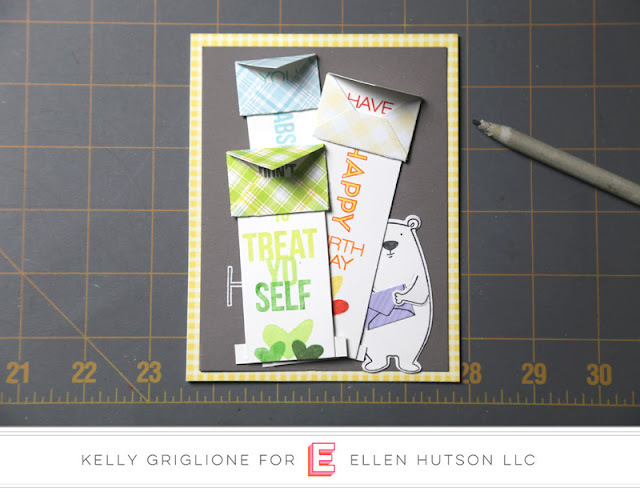 Use the envelope to store several different trinkets that go along with the theme of your card. I think of this as being very similar to collage-style cards, only you can't necessarily see all the different elements. This envelope holds many of the dies from a recent release, the Essentials By Ellen Leading Ladies: Dog Lady. It's a collection of things that a dog may be happy to see (like the sentiment says): his bone, a baseball for playing catch, and the love his family has for him. The envelope also holds a die cut "Hello" which is meant to be the first part of the sentiment, "Hello, Always Happy to see You." It makes me happy thinking of all the different treasures that can be tucked away. The sentiment is from the Leading Ladies: Dog Lady set. I had the doggie sign it by putting his little paw print underneath. 4. Just use the envelopes for decoration. Not every card has to be interactive. 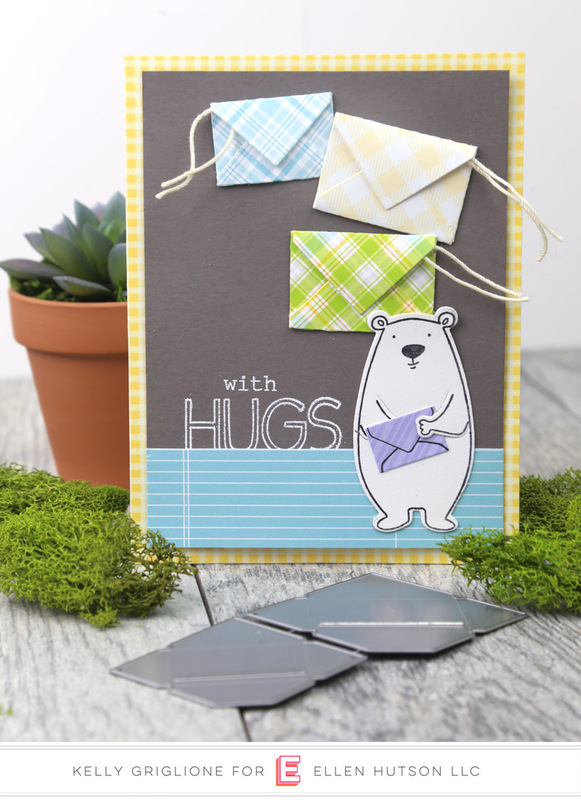 These adorable plaid envies from the Lawn Fawn Petite Paper Packs really stand out on their own. I decided to leave the top envelope flap loose since they looked pretty neat like that. It gives the card extra dimension without adding any additional bulk. Just because I could, I tucked a few hearts inside some of the envelopes. It's not super important that the recipient sees them right away, but I'm guessing they'll come upon them sooner or later for a fun surprise. Hope you enjoyed seeing some different ways the Envelope Slider die can be used! Coffee or tea? Would you believe neither? I grew up only drinking water and that's my preference (which is odd because we had such awfully rusty water). I'm kinda scared if I start drinking coffee that I'll become seriously addicted to it. So I don't. Tell us one silly/random/interesting tidbit about yourself! My old neighbor and I are huge Green Day fans and traveled to see them in 5 different venues on their tour last year. When I met Wanda Guess at Creativation this year I found out that she's a die-hard fan as well! Your next stop on this hop is the wonderful Kittie Caracciolo! I am SOOOO excited to be on this team with you, my friend. As usual, you have blown my mind with your creativity and I love your die tip! OH. MY. PEAS. These cards are SO clever and SO cute!!! Haha, I also started my blog as a way to showcase my party decor that I created for baby showers and wedding showers that I was throwing at that season of my life! So excited to be on the team with you! Cute way to use envelopes! 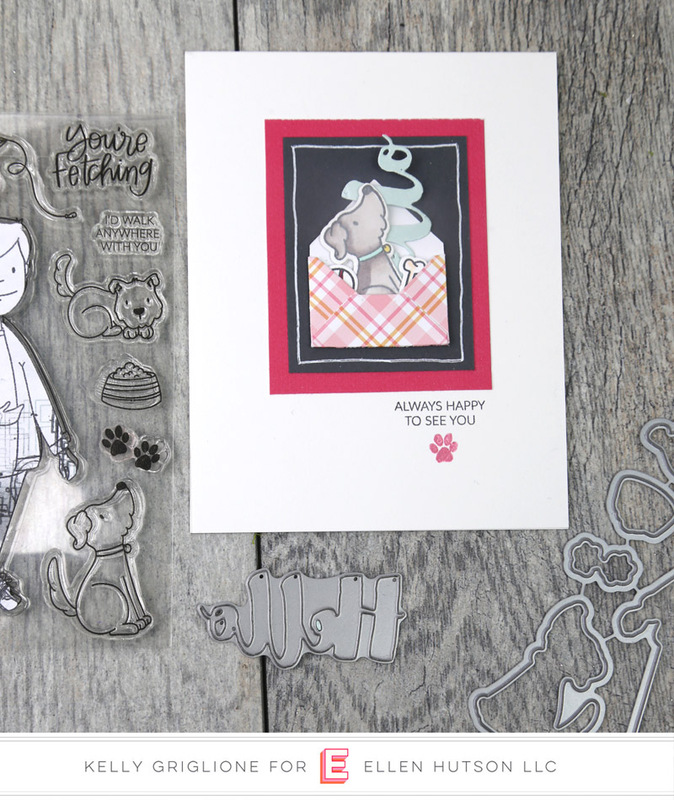 Your cards are absolutely adorable and so clever! I must add that envelope die set to my never ending wish list. Gosh! All those sweet cards! They are all awesome - my favorite is the dog-so adorable! Thank you. Wow! Your cards a amazing, love all these little envelopes,really have to get me one of these die sets to my wish list. Thank you so much for sharing your awesome cards. This post shows one of my most favorite things about you...that you show how to use products in so many different ways. PS I do the same thing with my dies and the misti! I kind of did it out of laziness (not a huge fan of trimming dies), but it’s one of my favorite time savers now. Love those little envelopes!! 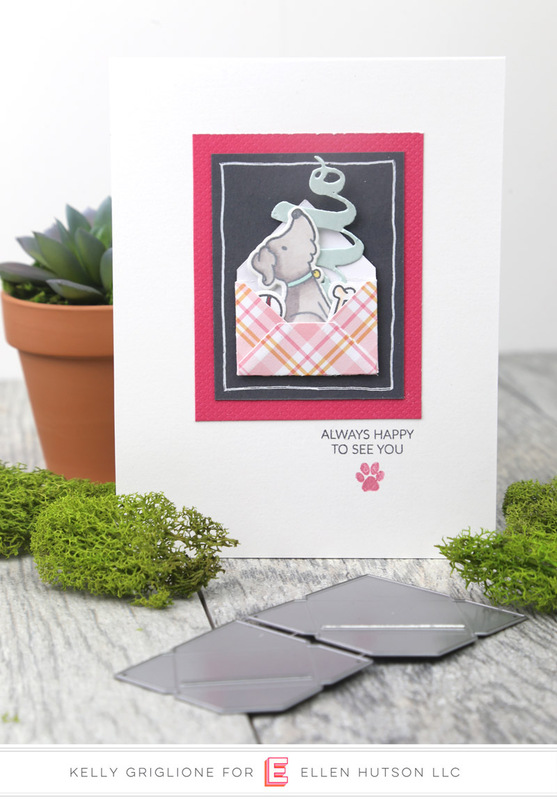 I just made a handful of cards today with the infamous little bear- I just love him!!! This is a fun blog hop and this is a fun post. Thanks for all the tips and the cute ideas! 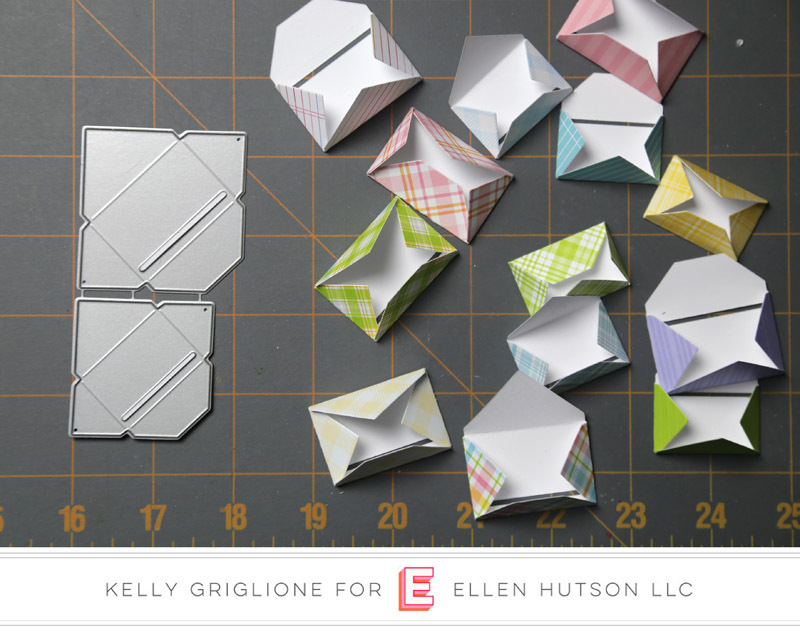 Great tip with the dies, Kelly -- I'll have to try that! Love your many uses of the envelopes ... fabulous cards! I look forward to getting to know you better on the team! Really imaginative. My grandgirls would love these! I love your cards Kelly, they are ALL fantastic ideas, I am definitely going to try these. TFS! Kelly, all of your projects with the envelopes are so cute and creative. I need to get my envelope die out and play again. I am so happy to be working with you on the Ellen Hutson team. 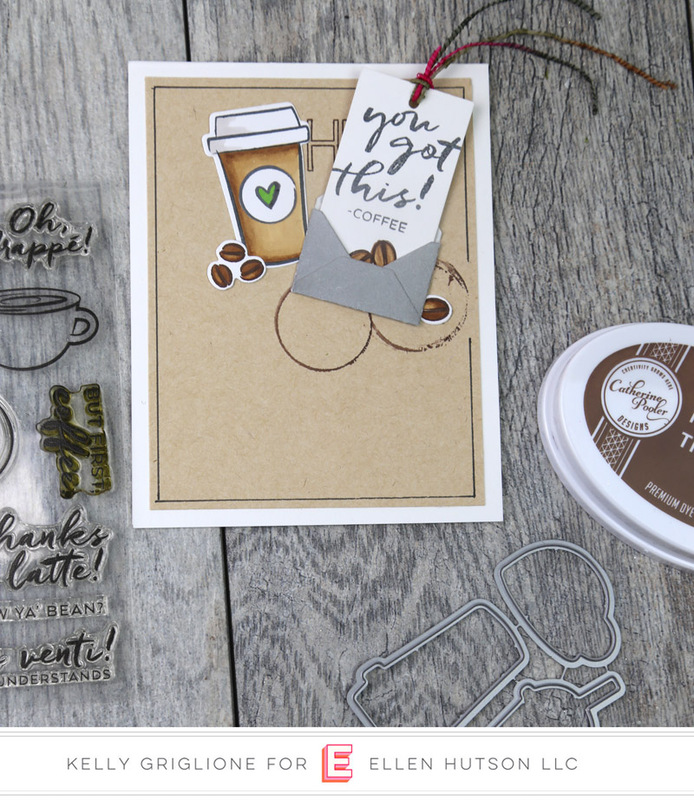 We have such a talented group of designers and it is so fun to see all the different paper crafting styles. Lots of adorable cards. I love how the sentiment slides out of the card, that is really cool. Heck yeah! I'm just as excited to be on the team too :) Love all your different cards with one little envelope!! I'm with you on the coffee too - my family is so addicted and can't function without a cup of java in the morning, I didn't want to go through that. (It didn't stop me from getting hooked on Coca Cola, lol.....maybe all that sugar!) Hugs! So so many gorgeous cards, would love your talent, you made more cards in one post than I make in a month. Mind you I do seem to try to make a card and get side tracked by laudrey, kids, sewing, being mum etc, I need your planning. AMAZING!!! 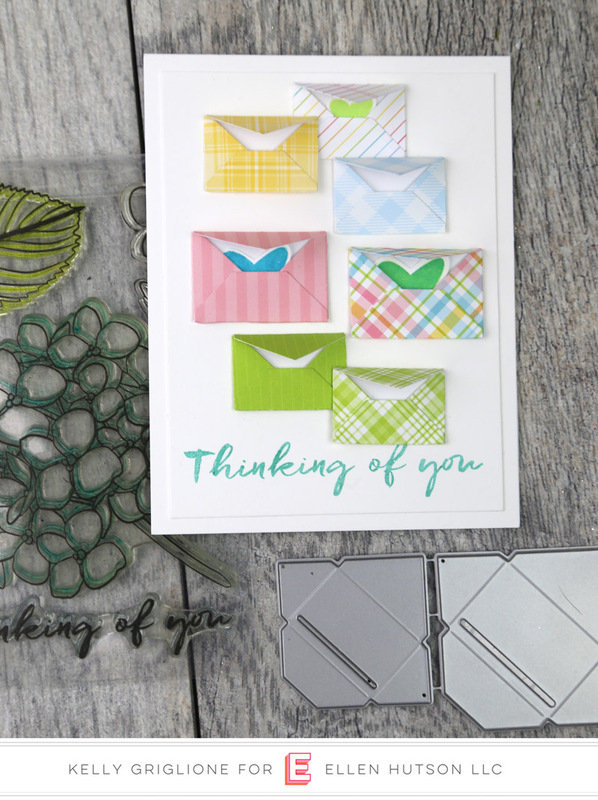 Love all of your cards made using these sweet envelopes! Very clever. Oh it's so wonderful to be with you on this team, it's going to be so much fun! WOWZA!! What an absolutely amazing post Kelly. Pure genius in the way you've used the envelopes, love these!! You always wow me with your amazing ideas!!! And I'm so thrilled to be on this team with you! This is fantastic! I can't believe how creative you are with these envelopes! I am an avid interactive card maker.....yet never knew how this die worked. Now I HAVE to have it!!! Do you just place a simple panel behind the front of the card to hide the "guts" (hidden messages)? I am super duper happy that you are on this team! Yay for you!!!! And these little envies are the cutest, love how you used them! Heck yeah! Just adorable! Thank you! Love these cards and the pull up note is genius. So fun and interactive. Great ideas!